New findings from a City University London study show that a campaign to increase the number of female experts used in news programmes has been successful. The study, led by Professor Lis Howell, found there have been substantial improvements in three out of the five major TV and radio programmes monitored. The academic called the results “astonishingly good news”, but stressed that men still outnumber women by an average of more than three to one. Channel 4 News showed the biggest increase, with a 37 per cent rise in the proportion of women interviewed since Professor Howell’s last study in 2014. Its ratio is now 2.6 to one. Sky News improved by 34 per cent to a ratio of three to one. And the Today programme, on BBC Radio 4, has matched this ratio, achieving a 19 per cent increase. However, ITV News at 10 has seen a dramatic 22 per cent fall in the proportion of female experts, with its ratio now standing at 4.9 to one. BBC News at 10 remains largely unchanged, at 3.9 to one, with a 2 per cent rise. Included in the research for the first time, 5 News has the best ratio of 1.6 to one. Professor Lis Howell, Head of Broadcasting in the Department of Journalism, revealed her findings at her inaugural lecture, on Wednesday 25th November, 2015. 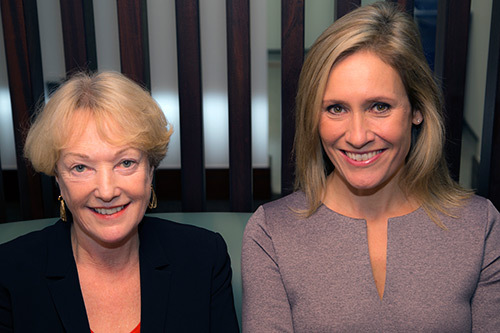 The presentation was introduced by BBC newsreader Sophie Raworth. Professor Howell said: “These results are astonishingly good news and show that the campaign to get more women experts used in news programmes has helped to change the industry. “However, women are still not being used enough by flagship shows in this country and it is clear that more work needs to be done. “ITV’s performance is shocking and, with the negligible progress of BBC News at 10, it raises the question, why are the two big beasts still like this? “The two-year campaign started by Broadcast magazine in 2012 appears to have made a big difference. And thanks to the Expert Women campaign by the BBC Academy in 2013, we are nearing its target ratio of three to one. The two programmes with the worst ratios have also shown falls in audience figures over the past six months: ITV News at 10 (-5.9 per cent); BBC News at 10 (-1.7 per cent). However, the three programmes showing substantial increases have all seen their audiences grow: Sunrise, Sky News (5.6 per cent); Channel 4 News (4.7 per cent); Today programme (8 per cent since 2010). Professor Howell’s previous research was conducted between 2013 and 2014 and showed that male experts outnumbered female experts on flagship news shows by an average of four to one. The new study covered 17 months between April 2014 and September 2015. Paid students in the Department of Journalism gathered the data from a total of 85 broadcasts of each programme.